Melt the butter with olive oil in a large (10 to 12-inch) saute pan. 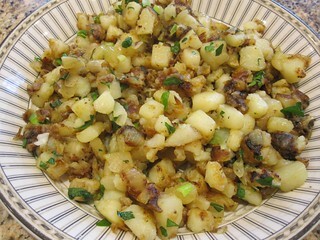 Add the potatoes, onions, salt, and pepper and cook over medium-low heat for 25 minutes, turning occasionally with a flat spatula, until the potatoes are evenly browned and cooked through. (Allow the potatoes to cook for 5 minutes before turning.) Turn off the heat and add the parsley and scallions. Serve hot.